GIVE THE PEOPLE WHAT THEY'RE CRAVING. It’s the ultimate gift—easy for you, delicious for them. They’re available online at any amount between $5 and $250, so you can show some love to the people you love (or just kinda, sorta like). 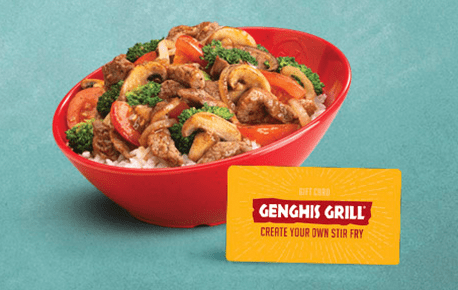 CAN I PURCHASE GENGHIS GRILL GIFT CARDS ONLINE? Absolutely. You can purchase Genghis Grill Gift Cards here. We use Fedex or USPS to ship traditional, plastic Genghis Grill Gift Card orders. Please allow 5-10 business days for delivery. WHERE CAN I USE MY GENGHIS GRILL GIFT CARD? I'M HAVING A PROBLEM PLACING A GENGHIS GRILL GIFT CARD ORDER THROUGH YOUR WEBSITE. WHOM SHOULD I CALL FOR HELP? We can help with that. Call 1-888-GENGHIS and we can get your online order sorted out. ARE THERE ANY MONTHLY INACTIVITY FEES? No, Genghis Grill does not charge a service fee for balances that remain on a Genghis Grill Gift Card. DOES MY GENGHIS GRILL GIFT CARD HAVE AN EXPIRATION DATE? No, Genghis Grill Gift Cards do not expire. WHAT SHOULD I DO IF MY GENGHIS GRILL GIFT CARD IS EVER LOST OR STOLEN? Lost or stolen Genghis Grill Gift Cards will not be replaced.